Close & clean. Gillette Venus Classic razor blade refills are the mother of women's blades: the original. They feature a lasting lubrastrip with a touch of aloe for an easy glide, giving you a close and clean shaving experience. Lubrastrip helps keep the razor gliding across your skin with comfort. 3 curve-hugging razor blades for a smooth shave. The pivoting, rounded head hugs curves and fits easily into hard-to-shave areas. Any Venus blade fits any Venus razor handle, except Simply Venus. Gillette Venus Smooth Women's Razor Blades are the first 3-bladed razor blades designed for women. They feature 3 curve-hugging blades surrounded by protective cushions which smooth out skin for a close and clean shave in just 1 stroke. 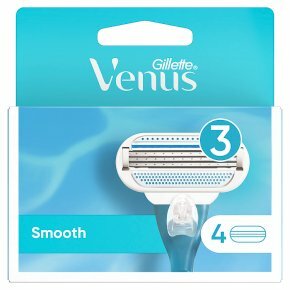 It also features a blue indicator strip that fades away to tell you when you are longer getting the optimal Venus shave.